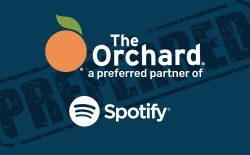 Spotify & Apple Name The Orchard As A Preferred Partner! Apple Music and Spotify recently shared recommended partner lists to inform labels and artists of reputable distributors who deliver music to their platforms. The Orchard is very excited to share that we are the ONLY distributor to top both lists with Preferred Plus Partner status at Apple Music and Preferred Label Distributor at Spotify. Our vast service offerings, access to detailed analytics across both platforms, delivery success rate and more have contributed to this ranking. Here at The Orchard, we take great pride in our streamlined system that allows us to effectively meet the requirements of various services and deliver your music to the masses.